Thank you for visiting our variety bands page. Currently our agency offers a large roster of Classic Rock Bands, Variety Bands and Top 40 Bands. We do not list all the bands we offer on our website at this time. If you would like a list of our bands our would like to view our bands and listen to a sound clip from any of the bands. Our agency will be more than happy to send you to our electronic presskit site. Once you receive a quote or would like to view the bands we will then send you a link and a password to do so. 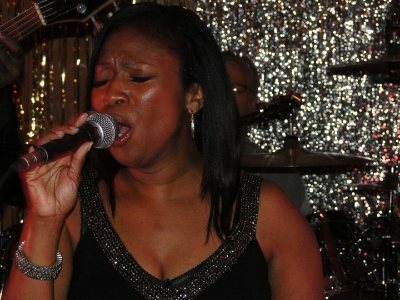 Here's a promise; the first time you hear Donna Massey perform, you will say to yourself, "WOW, now that girl can sing!" There's no doubt about it, Donna Massey just doesn't "cover" a song, she wraps it up, rolls it in flour, and puts on a deep southern fried R&B coating that's the best you'll hear (taste) this side of Motown. Blue Eyed Soul, featuring Donna Massey, performs the music you (and your kids) grew up with. With over a century of combined musical experience, (even longer in dog-years) they cover a musical spectrum from pop to rock, from rhythm and blues and Motown, to very easy listening. Vocals get the spotlight in this group, as Donna and her four vocalists blend smooth harmonies and punchy vocals to add variety, (you better believe that Donna and Monica can hit some high notes, ya'll). These professionals know when to make the dance floor shake, and when to ease back and allow the audience to get better acquainted, without having to YELL at one another. So, if you like the solid dance music of Maroon Five, T-Pain, Eminem, Chaka Kahn, Alicia Keyes, Aretha Franklin, Sheryl Crow, Pointer Sisters, Prince, The Rolling Stones, The Temptations, and many others, then Donna Massey & Blue Eyed Soul is the band for your special event. 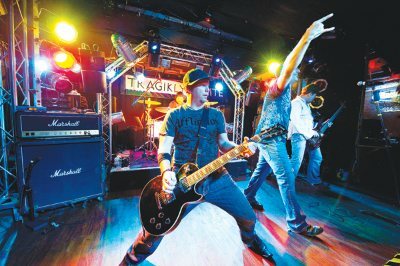 Formed in 1993, Tragikly White has earned a reputation as Little Rock Arkansas' premier dance band, playing a variety of hit tunes from the '70s to modern classics. Tragikly White has played for some of the biggest corporations in Arkansas - Dillard's, Arkansas Children's Hospital, Wal-Mart, Tyson, etc. "Tragikly White is easily one of the best party bands in our midst (the world? ), and the crowds ﬂock to party with them whenever they play. "Peter Read, "Nightflying" Magazine. The Rythmn Shakers" are a very rootsy' versatile, high-energy sounding four - member variety dance band from Little Rock, Arkansas with unique talent and stage presence. Best described as a true variety band, with a mixture of percussions accompanied by guitar, bass, and keyboards. Also, including a specialized sound and lighting production, a driving rhythm section, precision backups, and exceptional singer-entertainers complement an accredited presentation. This Little Rock, Arkansas based bands enthusiasm generates unmatched enjoyment for those on your party's dance floor and top notch excitement to those on the edge of their seats. The band's experience, professionalism, and management complete the package guaranteeing the best in local, live entertainment..
"The Rythmn Shakers" are located in Little Rock Arkansas and are a variety dance band performing at Company functions, Wedding receptions, Reunions, Benefits, Event socials, Festivals, fundraisers and more. Classic Rock, R&B, Motown, 70s, 80s and beyond. Little Rock Entertainment Agency - Offers the best bands in central Arkansas. If you need an Arkansas band for your event, we offer over 600 bands from all types of musical genres. We are unable to list every band in Arkansas and Little Rock on our website. If you have a band in mind and you don't see the band you are looking for listed. Give us a call we would be happy to send you a band roster of all our great Arkansas bands. On this page we are listing Arkansas variety bands. Please take time to view our other pages on this website to find the band or bands you are looking for your event.